We usually meet on the last Wednesday of each month and on the second Tuesday of every other month, at 9:30am by the village hall. Walks are not long or strenuous; 5 or 6 miles on average, each with a different leader. 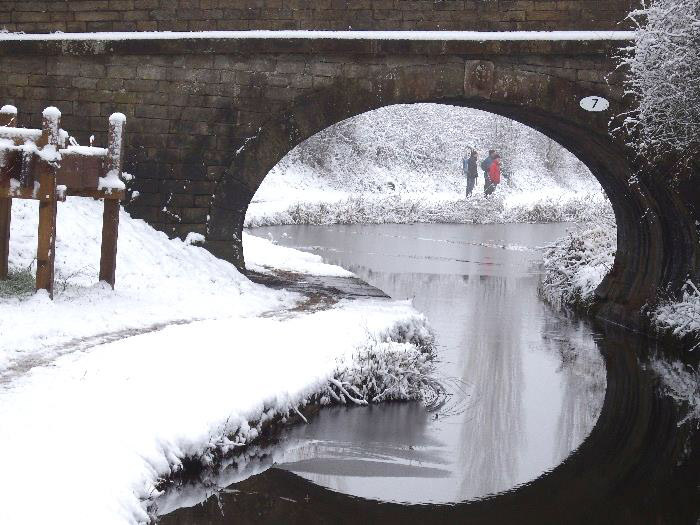 Come along to see the countryside in all its moods, sometimes bathed in sunshine, often with a shower or two, even perhaps with a carpet of snow! 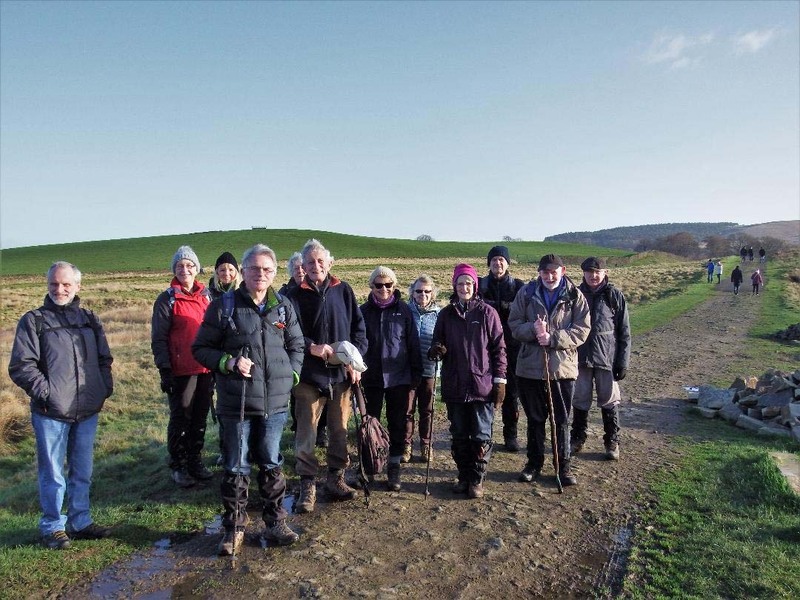 Our walkers might pass stone-age remains, badger setts and tracks, and fascinating old farmhouses and cottages. They will certainly enjoy sweeping views over the Cheshire plain, Peak District panoramas of hills and dales, and gentler scenery by canals and parkland in Lyme, Alderley and Ladybrook. You are guaranteed a friendly welcome when you join us. Unusually, today's walk started and ended at the Village Hall, with a pub lunch included. Jeff Mortimer led thirteen of us through High Lane village to pick up a footpath at the Woodside Tennis Club. We then walked by the primary school and recreation ground to cross the railway line and pick up the Goyt Way footpath. This took us by Elmerhurst Cottage and then along a track towards Platt Wood Farm. Here we took a climbing path to enter Lyme Park over a ladder stile. Crossing the west edge of Lyme Park revealed lovely views of Manchester and the Cheshire Plain. We left Lyme park at West Parkgate and then traversed some fields to pass near Keeper's Cottage and then on to Birchencliff, which is an unusual hamlet, now converted to holiday lets. After this we proceeded along Shrigley Road to pick up a path at Harrop Brow, passing Lockgate Farm and then on to Middlewood Way. At the site of the old Higher Poynton station some of us ate a packed lunch while most of us went to the nearby Boar's Head and enjoyed a pub lunch and some liquid refreshment. After lunch it was simply a leisurely walk along the canal towing path to the Bull's Head in High Lane and then back to the Village Hall. There had been heavy snow overnight so only five of us turned up at the Village Hall car-park. The walk was to be led by Rick Hedley who had planned to start and finish at Hague Bar car-park near New Mills. However as the road there was steep and winding and would probably be covered in ice, we decided to postpone that walk, and instead start and finish in High Lane. Most of this walk was along the canal tow-paths. 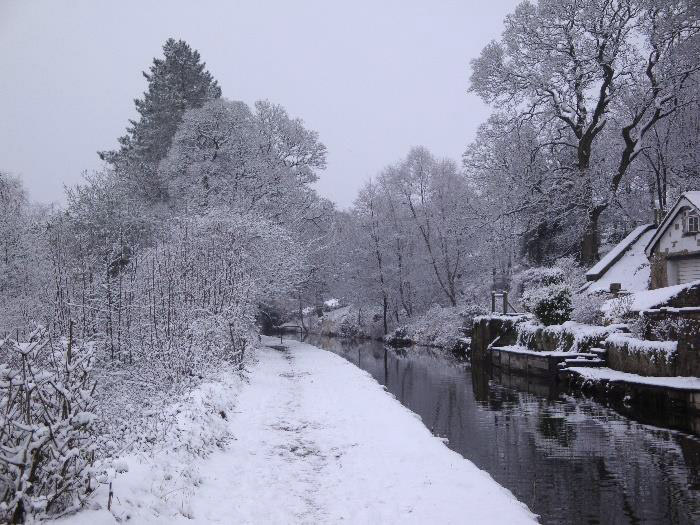 Initially along the Macclesfield Canal to Marple where we stopped for coffee and photos. We then followed the Peak Forest Canal south crossing a bridge to take a path through Stanleyhall Wood to pick up a track to Lea Cote Farm. Here we followed footpaths accross fields to Windlehurst Hall flats , then along a path adjacent to the canal to emerge at Andrew Lane where we again found the Macclesfield Canal tow-path. We did not however return to the car park, but continued under the A6 to the Bull's Head, where we enjoyed a welcome pub lunch and drinks. A beautiful day and an excellent turnout of 25 people. 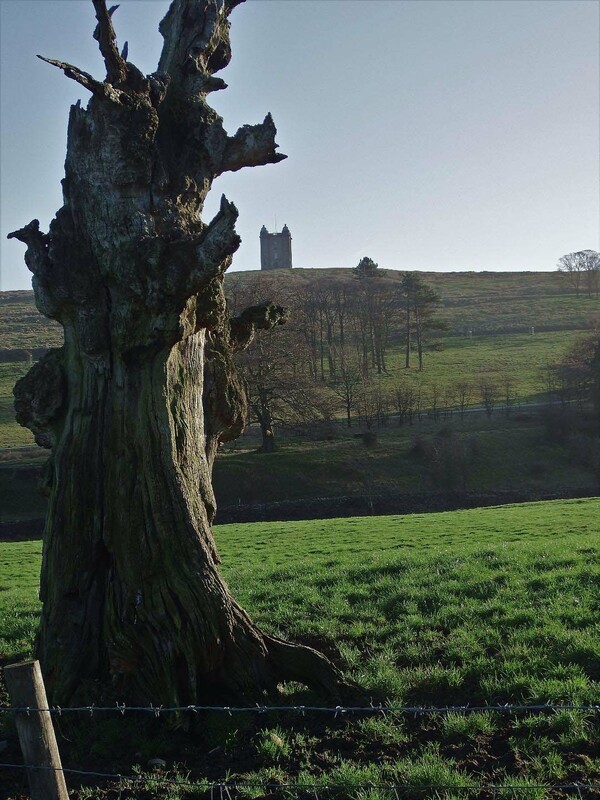 We started the walk from the car park in Lyme park and made our way up to Bowstones Cottage where we paused to get our breath back and look at the bowstones. We then carried on along Gritstone Trail past the trig point on Sponds Hill to the view point where we stopped for coffee. After that, retraced our steps back to follow the park boundary downhill and cut across to Bakestone Moor. On route we passed by the capped off entrances to two disused coal mines. 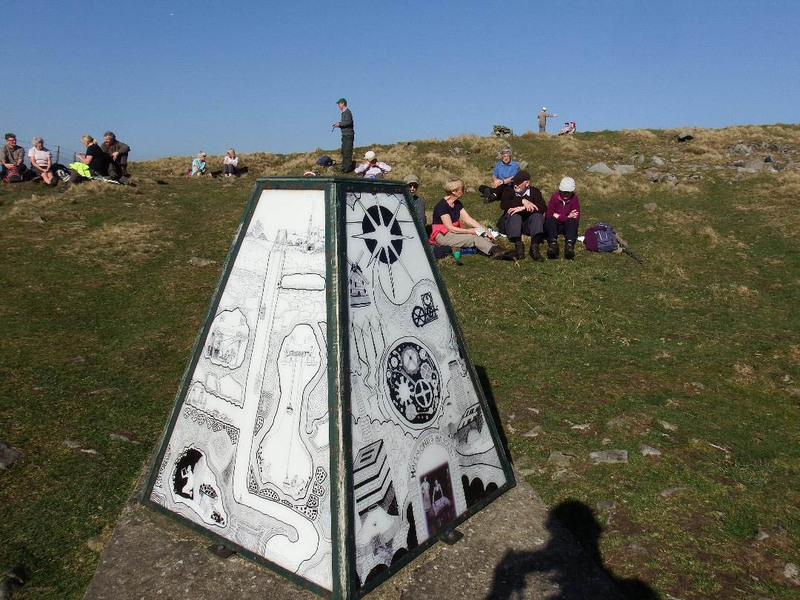 A short climb took us to an obelisk depicting the information of the coal mines in the area. We stopped for lunch in glorious sunshine. We then made our way down to Keepers Cottage and on to the west gate of Lyme and from here back through the park to the car park. An excellent day covering 7 miles. 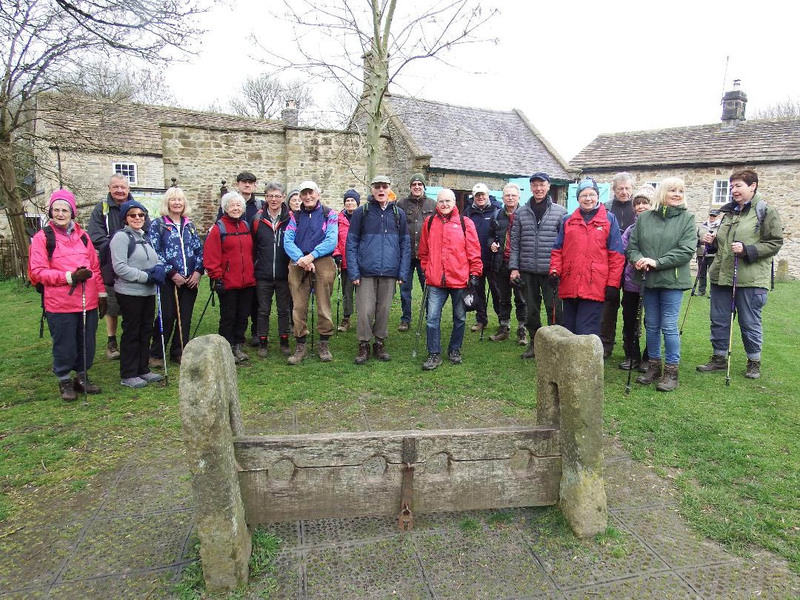 Walk Report - Wednesday 27th March 2019 Foolow and Eyam, Derbyshire. 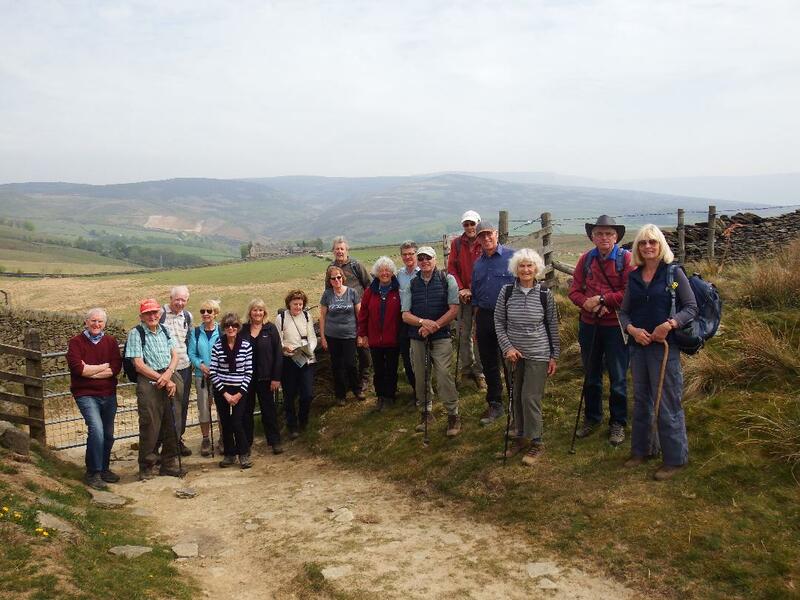 Mike and Sandra Moran led a group of 22 on a 6 mile amble in Derbyshire on a pleasant bright dry day. We parked on the green by the duck pond in the lovely Derbyshire village of Foolow and followed field paths to the famous plague village of Eyam, where we enjoyed a coffee stop on the village green by the old stocks, everyone was on good behaviour so we had no use for them! Our onward route followed a bridle path and field paths which eventually circled round back to Foolow village. Some of the group enjoyed a remarkably good quality/value lunch in the welcoming Bull's Head pub, well worth another visit. Nine of us set out on a beautiful sunny but deceptively cold, spring morning from Brabyns Park in Marple. From the canal side we descended under the aqueduct and viaduct and then followed the River Etherow and some very, very muddy paths through the wood into Compstall. 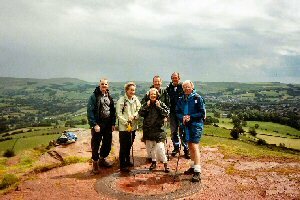 After a short coffee break we began the steady climb to the top of Werneth Low where we admired the views over Cheshire, Derbyshire, Lancashire and Yorkshire. Following a civilised lunch break at picnic tables we descended through fields and woods to Etherow Country Park where the weir and mandarin ducks offered ideal photography opportunites. The final stage of the walk was back through the centre of Brabyns Park to complete the circle. 19 folk met in Birch Vale for the 5 mile Mystery Walk. 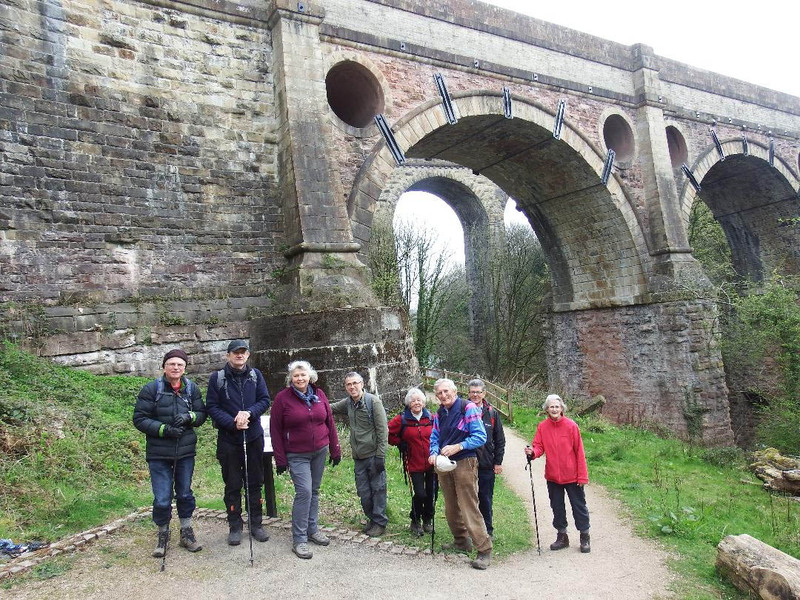 The group walked down the Sett Valley Trail via Bluebell Wood (with strong perfume from the blue bells) towards Hayfield where a coffee break was agreed,picnic benches available. Crossing the bypass into Hayfield behind the church over the river and diverting off road down the calico trail to School Field. A little road walking, passing stone cottages (chatting to a lady in her garden with large black dog) and then upward until reaching the lower slope of Lantern Pike, with views of Little Hayfield and Kinder Scout. Despite breathlessness everyone made the ascents. The group then veered off left away from the path leading to Rowarth for yet another ascent, on reaching the top with magnificent views, we sat down for lunch in a slight breeze and hazy sunshine. Of course, downward was our next challenge with track, road (named Stitch Lane)and path - a steep decent to the Sycamore Pub and our parked cars.